West Indies completed a crushing 226-run victory over Sri Lanka just after lunch on the final day of the first Test on Sunday as the tourists surrendered meekly following the demise of century-maker Kusal Mendis and captain Dinesh Chandimal. Set a daunting target of 453, the Sri Lankans crashed from 189 for three in mid-morning to be dismissed for 226 just after lunch, suffering their first Test match defeat at the hands of the Caribbean side for ten years, when they were also beaten at the Queen's Park Oval in Trinidad. His dismissal of Chandimal in the last over before the lunch interval broke the back of the tourists' resistance and he claimed three of the remaining four wickets to fall to finish with the impressive figures of four for 15 off 8.2 overs. It looked so much better for Sri Lanka when Mendis, 94 not out overnight with Sri Lanka on 176 for three, reached his fifth Test century shortly after the start of the day's play. Stubborn nightwatchman Lahiru Gamage had fallen LBW to leg-spinner Devendra Bishoo for just three after more than an hour's resistance but the death knell was really sounded for the Sri Lankans when Chase accounted for both Chandimal and Niroshan Dickwella in the space of five deliveries. It was hardly the sort of example he would have wanted to set as Sri Lanka's captain. "I think our fielding was below par in the first innings when we dropped some important catches," said Chandimal in reflecting on his team's disappointing overall performance. "We need to learn from our mistakes and regroup quickly for the next match." West Indies were in no mood to slacken their grip on the match on the resumption after lunch as Bishoo had Rangana Herath taken at short-leg before Chase sealed victory with the wickets of Suranga Lakmal and Lahiru Kumara off successive balls, both adjudged caught behind by 'man of the match' Shane Dowrich. 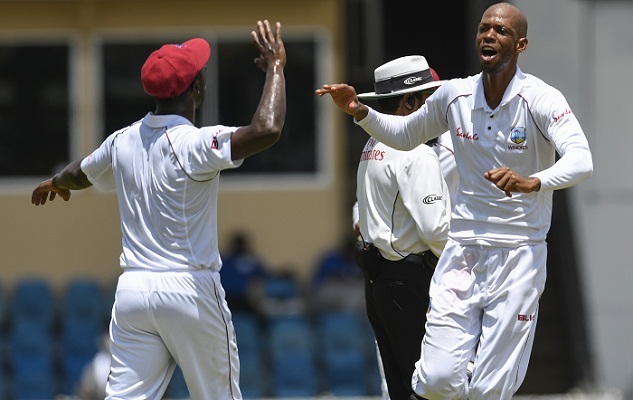 "I just wanted to stick to the basics and make the most of all my preparation coming into this series, and it worked out for me," said the wicketkeeper-batsman, whose unbeaten 125 was the cornerstone of the West Indies first innings recovery and final total of 414 for eight declared. "Consistency is something I have been striving for because I want to score runs in every game." He also hoisted two sixes in a determined innings that occupied 110 deliveries. Yet for all that time at the crease, there was nothing he could do to avoid an unplayable delivery from Gabriel which kicked off a good length to brush the batsman's gloves on the way through to Dowrich. "Everyone in this team deserves enormous credit for the way we battled through on a pitch that wasn't the easiest," said Holder in reflecting on a victory achieved after two declarations by him. "I wasn't worried coming into this final day because the pitch was deteriorating a bit and I just felt our bowlers had to build a bit of pressure and we would be able to strike, and when we struck we got wickets in clusters." Match situation: West Indies won by 226 runs.